World renowned Ndebele artist Esther Mahlangu has been awarded an honorary doctorate by the University of Johannesburg for “her legacy as a cultural entrepreneur and educator, skillfully negotiating local and global worlds”. She is now known as Dr Mahlangu. The university’s chancellor, Professor Njabulo Ndebele, relayed a personal story of the significance of Mahlangu’s work. “When I visited the British Museum, I saw the iconic BMW which was painted by Dr Mahlangu. It shows us that no matter where we are in the world, the Ndebele paintings have become an iconic sign of South Africa,” he said. 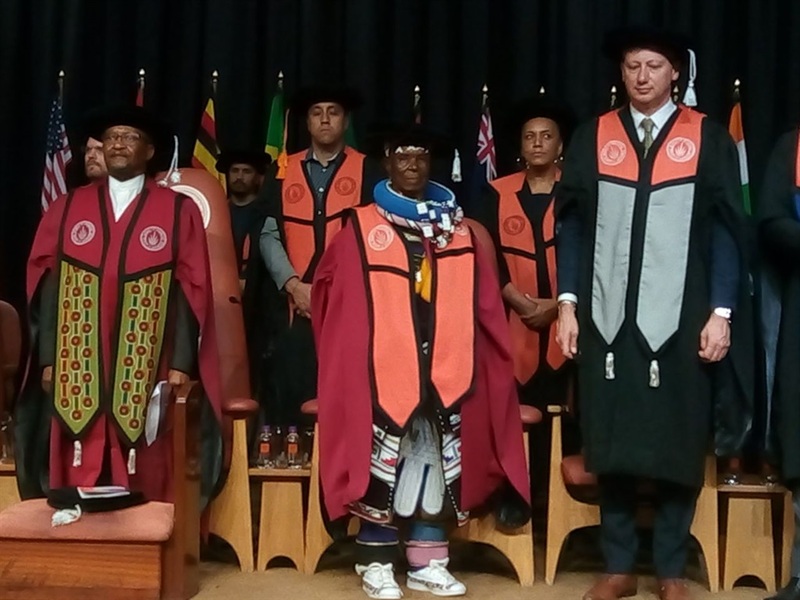 Mahlangu entered with the university’s academic procession, adorned in traditional Ndebele attire, with a gold necklace and gold rings around her legs. Wearing a pair of white takkies, Mahlangu personalised the pair by attaching a line of beaded Ndebele designs around the sides. She sat patiently as she watched over each graduate receiving their degrees, and when it came time to receive her own doctorate, the tone of the graduation went from formal to jovial. Mahlangu took to the podium to thank everyone briefly, when fellow guests close to Mahlangu took to the stage to celebrate in her achievement. Donning animal skin and wooden sticks, three men paid tribute to Mahlangu by dancing on stage. Mahlangu – known for her paintings closely linked to her Ndebele heritage – has grown to be one of South Africa’s most celebrated artists, gaining international recognition for her contribution to the arts fraternity, both locally and abroad. In 2006 she was awarded The Order of Ikhamanga (Silver) by the South Afican government, which is an order issued by the president to a person for their invaluable contribution to the arts, culture, literature, journalism, music and sports fields. At 82, Mahlangu’s zealous nature, which is constantly at the forefront of creating unique and culturally significant pieces, knows no bounds. Born in 1935, Mahlangu was first inspired by the guidance that her mother and grandmother brought to her when she was taught to paint and learnt the art of beadwork by these leading ladies in her life. She received recognition for her artistic flair and striking Ndebele patterns which she painted on her house – a skill which the women of Ndebele houses traditionally exemplify. According to Ndebele custom, a house that is well painted means that the wife of the home is a good mother, wife and daughter. Some of her most famous works include being commissioned by BMW to apply her skills on the panels of a BMW 7-series in 2016. The vehicle formed part of BMW Group South Africa’s Heritage Collection. • In 2012, Mahlangu showcased a solo exhibition called Overlay at 34FineArt in Cape Town, which was then taken to various other countries. • In 2014, Mahlangu was commissioned by the Virginia Museum of Fine Arts in the United States to create two large-scale paintings, which serves as the gateway to the museum’s African art gallery. The work took a month to complete. • In 2017, Mahlangu was honoured with a two-lane Ndebele mural in New York City, which commemorates the work she has done in New York. It was done by Imani Shanklin Roberts. In May Mahlangu will participate in an international women’s exhibition, which includes 85-year old Japanese artist Yoko Ono, at the the Nirox Foundation Sculpture Park (in partnership with the Swedish Wanas Foundation) located in the Cradle of Humankind, near Johannesburg.